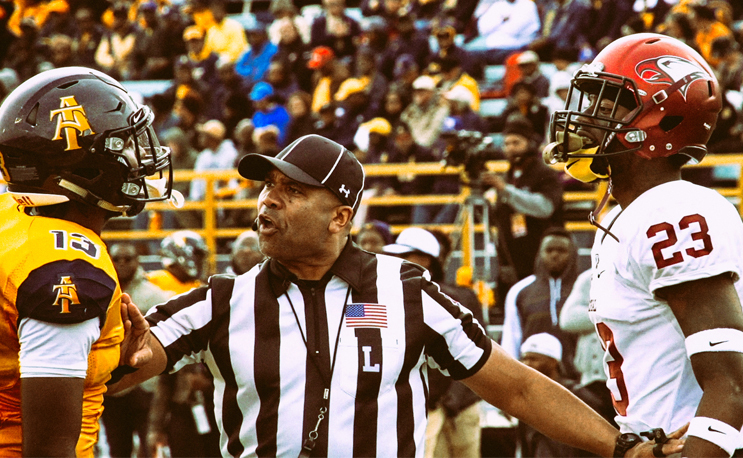 Having already secured at least a share of the MEAC title and a spot in the Celebration Bowl; North Carolina A&T entered this year’s rivalry contest with one goal in mind. Beat North Carolina Central. With a win, North Carolina A&T’s senior class would get their first victory against North Carolina Central in the last three tries and the Aggies would become the first ever MEAC squad to go 11-0 in the regular season. With about 30 minutes before kickoff the Aggies and the Eagles met at midfield for a little bit of rivalry game shenanigans. Nothing transpired beyond pushing and shoving but 4 flags were been thrown and one player was ejected. The ejected player was NCCU Defensive Back Davanta Reynolds, who has been a nightmare for opposing offenses with 6 interceptions. The Aggies secured the 24-10 victory and will head into the Celebration Bowl as MEAC champs. Their second trip in three years, A&T looks to bring the trophy back to North Carolina and finish the season with a perfect 12-0 record.